Love epic space battle games? Wish your child could play with you? Experience Battle Beyond Space; a game perfect for gamers young and old. These reviews provide insight on some of the best games for families with young gamers. Written from a parent’s perspective for a fun and educational family game night! In Battle Beyond Space, you are one of four races that have sent a fleet of ships to an asteroid field to recover an ancient artifact from a long extinct race. Deploy your fleet, move your ships and eliminate the other contending races. Your time is limited but your race has a unique power to help your cause. After nine turns, points are calculated. The player who has destroyed the most opposing ships, and collected the most ancient satellites without falling prey to his rivals’ fleets wins. Each player chooses, or is randomly assigned, one of the fours races: The Dreckach, 8-foot tall frog-like bipeds, The Vonyan: lean and nervous aliens who excel at propulsion, The Valkyrie: a race of female warriors, and The Earthers: well…us! Each player receives a movement deck of nine cards matching their race as well as 18 fighters (three Squadrons of six ships) and two large Capital ships. Players choose, or are randomly dealt, one special power card for their race and place it face down in front of them. The rest are placed back in the box. Players then shuffle their movement cards, and place their starting fleet in a “deploy zone” on the game board. Players may all peek at the top card on their movement deck to decide where to place their starting fleet. Asteroid tokens are placed on the board and six sensor probe tokens are placed around the central asteroid. This is the player’s objective, which will be good to remember when the battle gets going! After completing these steps your turn is over and play passes to the player on your left. Now, here are a few specific rules about a turn. A ship CAN move through obstacles, but if you end your move ON another ship or asteroid, BOOM! It’s a collision! We’ll talk about what happens in collisions later. You must move all the ships in only one Squadron the full value shown on your movement card, so you have to plan carefully! After your Squadron moves… they get to fire! All ships in the Squadron that just moved fire in a straight line five hexes away. Unlike movement, you can’t fire through obstacles like your own ships, or asteroids. But you automatically hit any ships in range. No dice needed! Fighters do one point of damage on enemy ships. Fighters can only take one point of damage. So if you hit a fighter you destroy it and place it in front of you. Capital ships can take two points of damage. You collect them only if you destroy them with a second hit. Otherwise they get a damage marker. Then, rotate all the ships in that same Squadron up to the numbers of facings shown on the card. Squadrons move sort of like a school of fish, all moving and turning together as a unit. On the bottom portion of the movement card are the command numbers for the Capital ships. The same rules that govern fighters also apply to Capital ships however, Capital ships can divide the movement/turn number any way they wish in any combination of hexes and facings. Then, Capital ships can fire at ANY ship that is within 2 hexes of either of the hexes it occupies. Its laser is on a turret! If it’s an enemy ship, both ships are destroyed and exchanged as points. If it’s a friendly ship, one of your ships is removed from the game. If it’s an asteroid, the ship is removed from the game. If it’s a sensor probe, the player collects it for one point. 1 point for each enemy fighter they destroyed. 1 point for each sensor probe they captured. 2 points per sensor probe starting space occupied at the end of the game. 4 points for each enemy Capital Ship destroyed. The player with the highest points wins the Battle Beyond Space! Jake Murray has created some great art for the Alien races, and the whole game has a look and feel of a more lengthy space opera game. Tokens, cards and ship pieces are well crafted, though the two blue Earther fighter Squadrons are a bit difficult to tell apart (Just use a permanent market to color in the cockpit – or better yet paint them!). Since the ships lay flat on the play surface, they can be a bit difficult to pick up, but smaller fingers will have an easier time. Very easy. The game is curiously listed for ages 13 and up but it can easily be played by younger children. Kids as young as 6 can play with some help, as no reading is required other than the special power cards. Children a bit older will have a blast. Parents and adults will find the game instantly playable. 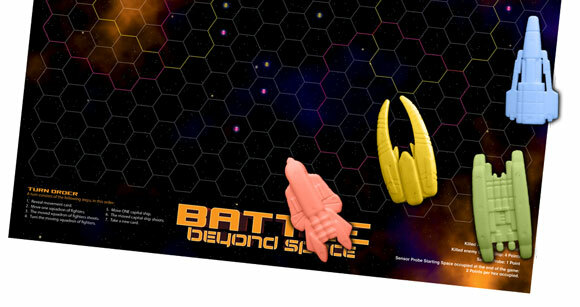 Battle Beyond Space gives you the opportunity as a parent to share an exciting space battle game with your kids, without any complicated stats and rules sets or even dice rolling. There are some things to be aware of though when you get this to the table with your 7-10 year old. Expect to collide. Since the movement cards are random, you may find your fighters facing a direction where you will have to collide with an obstacle or an enemy fighter, (since you must move the full value). Make sure that you emphasize that it isn’t because of a mistake they made, it will just happen from time to time and may actually be beneficial! They can ask for help. Games are supposed to be fun. And if they are having a tough time deciding what to do or when to use their race’s special ability, go ahead and give them a hand. The chaos of the game will make the game fun no matter what. Special abilities. Some are used once, others have continuing effects. (Pages 4-5 of the rulebook lists the Special Powers). Be versatile when choosing or drawing these for younger players – some can be game breakers. Moving Squadrons. Setting up your starting fleet is very important and so is choosing one of your three Squadrons to move. Openly talk through all the options with your younger players and they will more quickly learn how to do the tactical thinking on their own. Always… Always make space sounds effects when playing this game. Every now and then, a game surprises you. At first glance Battle Beyond Space seems like light filler. A more advanced gamer may wrinkle their nose at the limited tactical choices and oversimplified mechanics. But Frank Banham, whether intending to or not, has created the perfect game for families and younger gamers. Adult gamers will discover some unique and exceptional game interactions as well. Let’s start with younger gamers. As was said before, the game choices on each turn are simple. Read the movement card for the turn and follow its instructions. This shifts the focus to board positioning and tactical movement. If this sounds familiar, Chess works a lot in the same way. You know how your pieces move, but board position and the interactions of players’ moves create a multitude of game results. This is one of the foundational traits of a great game: easy to learn, difficult to master. The game also has a low level of randomness. The exclusion of dice gives a player a definite outcome for each of their actions. This “cause and effect” aspect is one of the most important lessons a young gamer can learn: each action has consequences. There is much more control here than in some games. Being a good sport is hard enough, but when your success relies on a die roll, it can be disheartening. Not so in this game. Lastly, the game has a goal: the ancient derelict probe in the middle of the board. Yes, ship kills and capturing sensor probes score you points. But ending the game in the center hexes scores bonus points. So survival and maneuvering toward that goal give the game forward motion. For adult gamers, one would think that all of the aspects that make the game a perfect fit for younger players would make it too simplistic for adults. Not true. The game offers a challenge of tactics, where aggression is almost always the rule of thumb. The special powers will give a different feel to each game and the movement deck mechanic, although seemingly limiting provides some very unique game play choices. Battle Beyond Space will surprise you with its foundational game mechanics and interesting player interactions. It’s the perfect space battle game you can share with your kids. Far beyond the bounds of the Solar System, a signal is launched that penetrates warp space. The signal is old—the only known working piece of technology from an ancient race. Four different fleets answer the siren’s call, intent on claiming the Artifact for themselves at all costs. The destination: a lone asteroid ringed by failed ancient satellites in the middle of a lifeless asteroid field. Your objective: Destroy the most ships and fighters, proving yourself in battle and gaining the artifact. Add a Review for "Battle Beyond Space"